Further enhanced security checks have been put in place to provide reassurance and confidence and we advise you to arrive in plently of time to pass through these additional security checks. Please note that out of consideration for our neighbours and for the purposes of safety, you are not permitted to queue or camp outside the venue prior to the day of the show. Major road improvement works, on one of the busiest routes in and out of Manchester and Salford, began on Wednesday 29 August 2018. The work will last for 12 months and will have a major impact on journey times. Additionally, work is taking place between junction 10 to junction 12 on the M62 as part of the Smart Motorway improvements. Highways England have provided an overview of the works on their website to help you plan your journey. To find out what work is taking place at each junction please visit the Manchester City Council MSIRR webpage. Where are the entrances to the Arena? We will be operating two main entrances: Hunts Banks located outside the Victoria Station (the large bank of steps) with entrance points as you approach from both Victoria station and from Deansgate. The second entrance is City Room via Victoria Station concourse. You can also access this entrance through either Trinity Way or the NCP car park. People without tickets will be asked not to approach these areas and to collect their tickets first from Box Office before heading to the arena entrances, this will help us speed up the entry process. We advise you arrive in time for the doors but also we recommend you access through the Trinity Way Entrance into the City Rooms entrance. This is located by the NCP Car Park on the Trinity Way ring road. Manchester Arena has and always will continue to review security measures in conjunction with Greater Manchester security and emergency services. Further enhanced security checks have been put in place to provide reassurance and confidence and we advise you to arrive in plenty of time to pass through these additional security checks. We also ask to please support and cooperate fully so our team can efficiently carry out these measures to ensure safety and ensure you are in the building in time for your show. We ask that you keep personal belongings to a minimum and only bring your essentials. Please do not bring backpacks of any size or large bags, as these will not be allowed into the arena. You are permitted to bring small bags or handbags no larger than 35cm x 40cm x 19cm (approx A3 size piece of paper). There will be no temporary storage facilities for such items within the venue and it will be left to the patron to find a safe temporary facility to hold the item. Bags left in unauthorised surrounding areas will be disposed of immediately. The venue will not be responsible for late admission or non-admission as a result of this policy. Manchester Arena prides itself on being a fun but safe environment for everyone. Anti-social behaviour towards other guests and/or staff is not tolerated in any form and any problems should be notified immediately to one of the stewards. They will either be able to rectify the situation straight away or may refer the problem to Customer Services, located on the concourse. It is difficult for Customer Services to respond to a problem if it is not reported at the time, so please make sure to speak to a steward or member of staff as soon as possible. [email protected] or by phone: 0161 950 5229. A temporary box office is situated on the Trinity Way corridor next to the Arena Car Park entrance. This box office will be available from 4pm only on a show day and will close 15 minutes after the main act has gone onstage. Opening times will change for Box Office depending on the time of the show. Please check this web page prior to you attending the event to ensure you have the most current up to date information. What does the City Room entrance look like? Renovation work is still underway in the City Room but it is sufficiently complete to re-open part of the space as a route to the arena. How long will the queues be? We have introduced some additional security measures in consultation with both Greater Manchester Police and British Transport Police to reassure everyone coming to the event. Therefore the process will take longer than usual and we ask that everyone arrives in plenty of time for the start of the show. What will be the process with ID checks? Please have your ticket ready for checking as this will take place on the perimeter of the complex. In addition, the lead booker maybe asked to prove their identity to gain entrance to the arena if it is a requirement of the show. If ID is required for entry this will be stated at the point of purchase. Where do I purchase tickets from? General sale tickets will only be able to purchase via our official ticketing partner Ticketmaster (www.ticketmaster.co.uk) (0844 847 8000). Accessibility Tickets can be purchased via the accessibility line on 0161 950 5229. We send most of our tickets out by standard post. If you chose for your tickets to be posted, please give it until 3 days before the event for your tickets to arrive. What if I am buying them for my family member of friend and they are in my name? If you are buying the tickets as a gift we would advise you to select the postage option. In addition, the lead booker maybe asked to be in attendance at the show and prove their identity to gain entrance to the arena if it is a requirement of the show. If ID is required for entry this will be stated at the point of purchase. Can I purchase tickets directly from your Box Office? No. Please purchase tickets directly from Ticketmaster or the Accessibility Team. Can I purchase tickets over the phone directly with the arena? Please send an email to [email protected] Make sure to include information in the subject line of your message. Can I collect them at Box Office? We would advise to have your tickets posted to avoid queues on the evening of the show. However if you have selected box office collection tickets can be collected on the evening of the show by the purchaser. What if I have lost my ID or have no ID? Please contact your point of purchase for further information. If you chose standard post, please give it until 3 days before the event for your tickets to arrive – even once they've left us, it can sometimes take a bit longer than expected to be delivered. If they still haven't arrived by 3 days before, please contact your point of purchase. Please contact your point of purchase for further advice. My confirmation email has not arrived? Whether you booked online or over the phone, you can expect to receive a confirmation email. The confirmation email will be send it to the email address you gave to your point of purchase when the tickets were booked and it shouldn't take any longer than 48 hours to arrive. If you still don't see it, please check any junk or spam folders. How do I purchase accessible tickets? Accessible Tickets can be purchased by contacting the accessibility team on 0161 950 5229 (10.00am – 5.00pm Mon - Fri, 10.00am - 4.00pm on Saturdays, excluding Bank Holidays). My credit/debit card has changed, I need this to collect tickets, what do I do? If you're collecting your tickets and you don't have the original card anymore, please take some photo ID along with your new card to collect the tickets – the staff at the box office just need to be sure that you're the person named on the order. Where is the nearest accessible parking and how far away is it? The nearest accessible parking is located onsite which is managed and operated by NCP. There are a number of blue badge spaces available within the car park and additionally within the surrounding areas of the Arena. 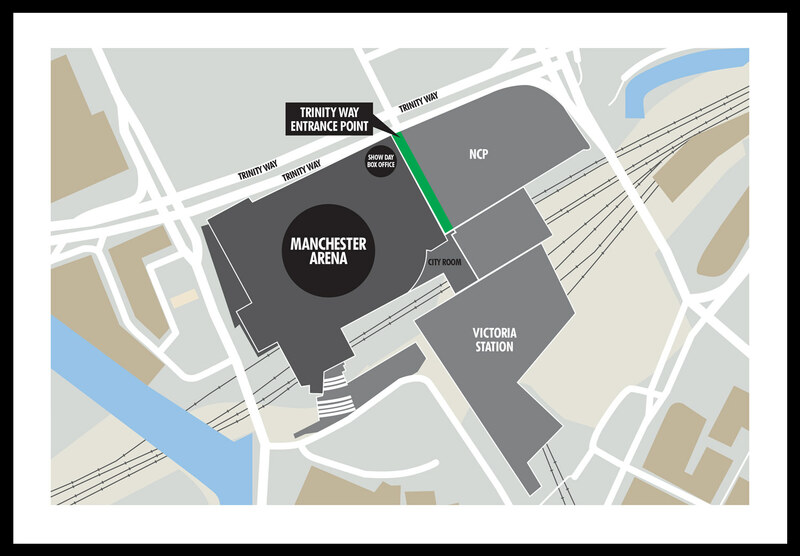 We advise anyone with walking difficulties to arrive as early as possible and use the NCP car parks at the Arena, Shudehill or The Printworks. Please note that the car parks do not fall under the jurisdiction of Manchester Arena. If you would like to pre book parking or have any further queries please contact NCP on 0845 050 7080. The car park is adjacent to the City Rooms entrance however please note that this area is only accessible to ticket holders on event days. What entrance is the best to use for access requirements? The best entrances to use for access requirements are the Hunts Bank and City Rooms entrances which both have level access to the venue via a lift. From the Car Park, providing that you have your tickets, follow the directions from the car park to the arena and you will reach a set of doors with a small flight of stairs on the other side, leading to the Arena entrance. There is also a lift to the right hand side of the doors that takes you up one level. From Manchester City Centre the best entrance to use is Hunts Bank which is located on Hunts Bank Approach. The lift at Hunts Bank is located to the right hand side of the stairs. The lift to access our City Rooms entrance is located within Victoria Station. There is also lift access from the car park and from Victoria Station. If you have any queries regarding the lift during an event please speak to a member of showsec who will be able to help you. How do I access my seats? For standard shows the Arena bowl has tiered seating starting at block 102 and goes round in an anticlockwise direction to block 115. Seats are numbered from 1 upwards meaning for blocks 102 - 105 & 202 - 205 seat 1 is nearest to the stage but furthest from the stage for blocks 112 - 115 & 212 & 215. The floor blocks are normally numbered 1 -18 left to right when facing the stage. Wheelchair accessible bays are located at Block 105, 108 and 109. There are also a number of accessible platforms located in some of the blocks. Easy Access Seats in Row X are accessible via ten steps down with a hand rail. Can I bring in medication? If you require to bring in medication we suggest that you discuss this with us in advance of your visit. Please contact the accessibility team to discuss your requirements further. Get in touch via email at [email protected] or by phone at 0161 950 5229. I need to bring something else into the venue e.g. Assistance Dog, Oxygen Cylinder, Ventilator, etc. can I do this? For other requirements for medical reasons please contact our accessibility team to discuss your enquiry further. Get in touch via email at [email protected] or by phone at 0161 950 5229. What if I need additional assistance during the show? Please speak to a member of our Show Sec stewarding team who are positioned around the venue. We also have a customer services desk which you can visit during the show with any enquiries which is located by our Hunts Bank entrance at Block 101. If you require any further information, please contact our Accessibility Team. You can call the Accessibility Team on 0161 950 5229. A text relay service is available via www.ngts.org.uk. Our postal address is Manchester Arena, Victoria Station, Hunts Bank, Manchester, M3 1AR.